With the wet season well and truly upon us, not much local fishing has been taking place. On the occasions I have been out there has been some good fishing for Spanish mackerel, yellowfin tuna and coral trout when bottom fishing. Have just returned from Port Stephens where I fished the NSW Interclub Tournament on the Calypso. The weather was also pretty ordinary cancelling 2 days of the 4 day tournament. The fishing was excellent on the days we did get out. The first day of fishing we would have raised at least a dozen fish though they weren’t quite in a biting mood. We managed to catch 3 from 4 bites – all striped marlin around the 70kg mark. On the second fishing day of the tournament after a strong wind warning, it was still quite rough with the seas around 3 metres. I didn’t raise as many this day, though we did catch our bites, getting 2 from 2 (1 striped and 1 black). This gave us a total of 5 for the tournament with the winning boat in the tag & release division being “Gorilla” captained by Brett Thomas, catching 7 fish for the tournament. 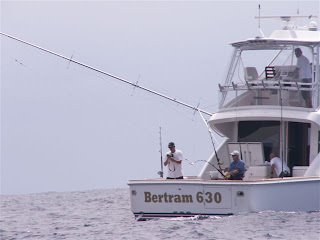 I did a fun day fishing on the new 63′ Bertram and wound a marlin in myself. It’s been a good long time (approx 14 yrs) since I caught my last marlin. Great fun as it was 1 of a double header. Continuing to fish now from Cairns for the rest of the year. Light to medium fishing for mackerel, tuna, marlin and sailfish.